Published on Saturday, October 6, 2018. This article appears in the October/November 2018 issue of American Craft Magazine. 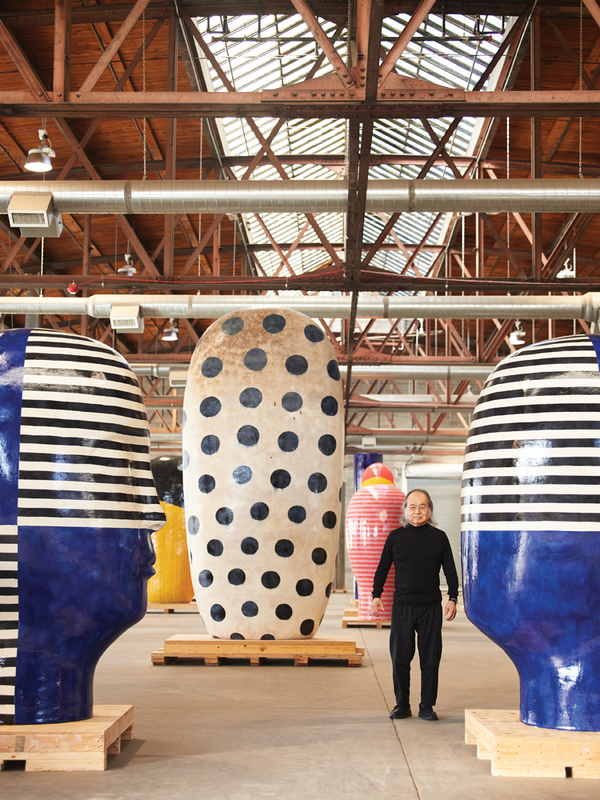 Jun Kaneko in his studio in Omaha, Nebraska, where he’s lived for more than 30 years. Though he tends to be soft-spoken, his drive and his vision, like his sculptures, speak volumes. We live in a distracted age. at any moment, our attention can scatter in a thousand sparkly directions. Staying on task to achieve something meaningful requires dogged, committed action. Focus is difficult – and essential. The 11 winners of the American Craft Council Awards profiled on the following pages are a testament to this kind of single-minded devotion. Nominated by other College of Fellows members, these artists – along with philanthropists and leaders – have dedicated themselves to craft for more than 25 years. They have reached a pinnacle few people attain because, whatever challenges and distractions they’ve encountered, they’ve kept going, one foot in front of the other. 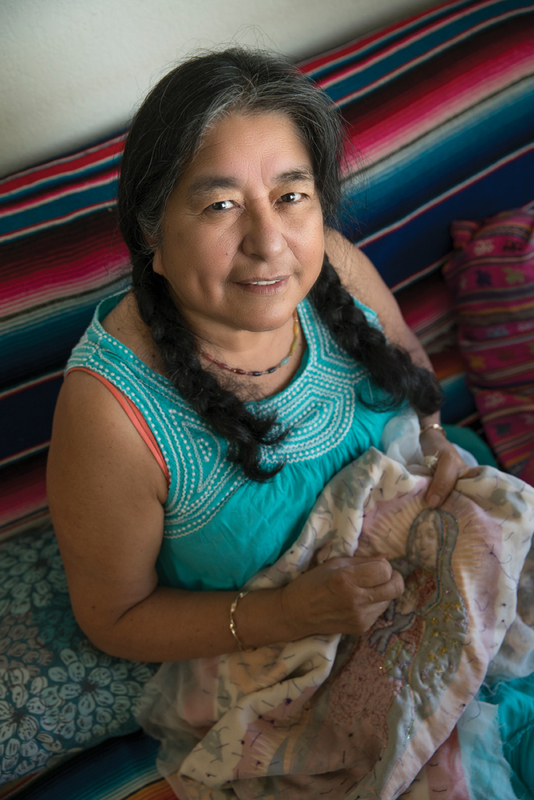 To stay focused, fiber artist Consuelo Jimenez Underwood sets clear goals every 10 years. In 2019, she turns 70, and she’s not slowing down; “I want to weave as much as I can,” she says. 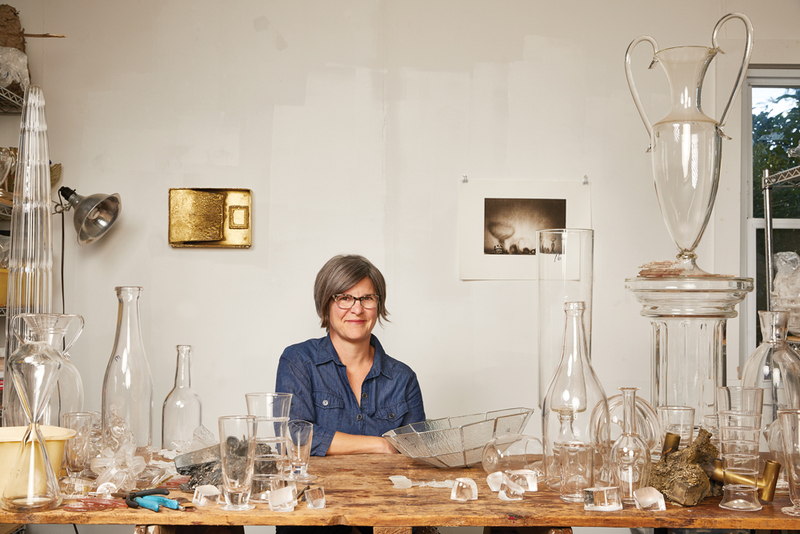 Every day, Janet McCall, executive director of Contemporary Craft in Pittsburgh, asks herself, “What difference can Contemporary Craft make?” That simple question has driven groundbreaking exhibitions that have galvanized her community. 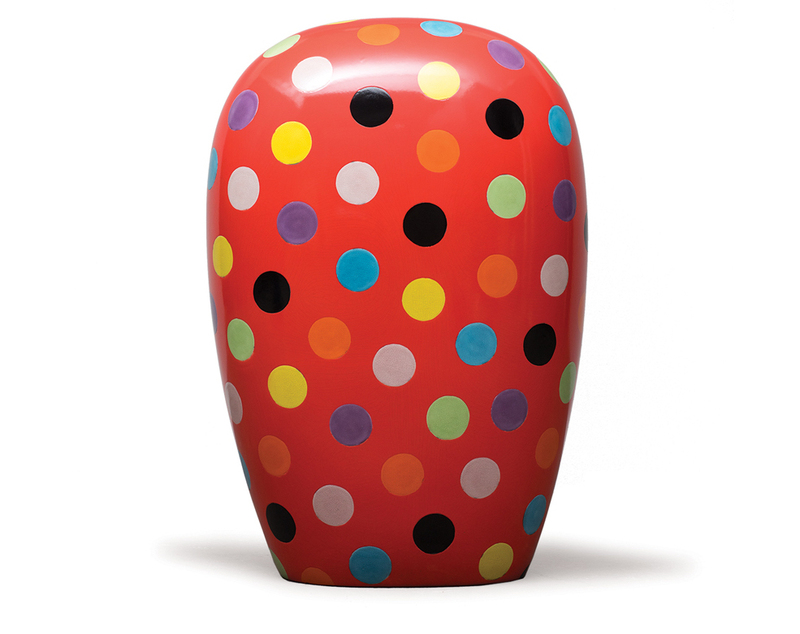 There is a sense of scale to everything Jun Kaneko does. 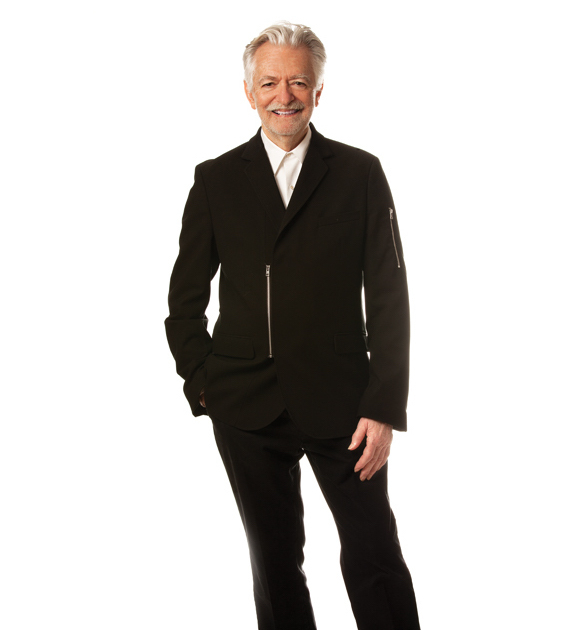 At 76, the artist has nearly 250 solo shows on his résumé. His work appears in more than 70 museum collections. He’s been commissioned to make more than 60 sweeping public art projects, including last year’s 82-foot tower, Search, in his adopted hometown of Omaha, Nebraska. 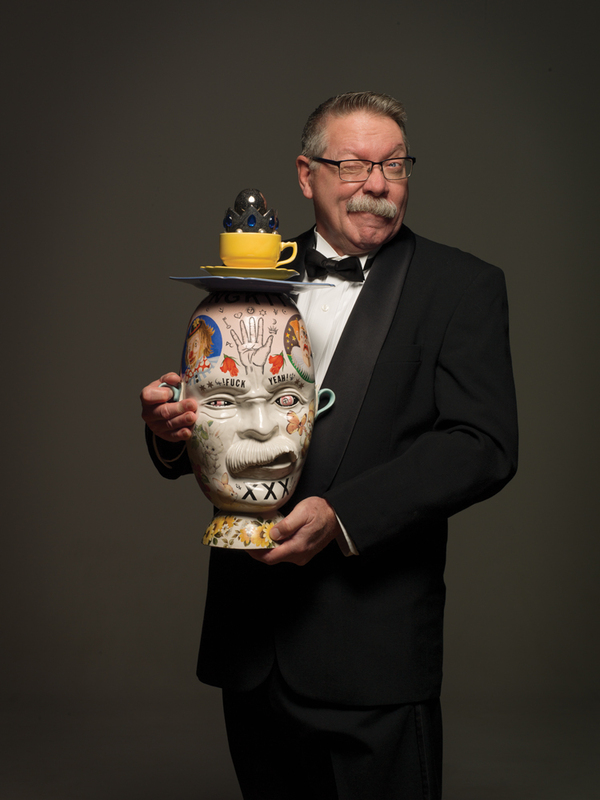 He’s known primarily as a ceramist, but he also paints and works in glass; he designed the sets and costumes for three major touring operas and co-founded two arts nonprofits. To tour any of his several cavernous studio spaces is to be dwarfed by 13-foot Dangos (“dumplings” in Japanese) and clay heads so large they take years to become leather-hard. No doubt, only a man with a plan – and serious ambition – could accomplish what he has. When you dig deeper, though, you see the role of happenstance in his life. He was 17 when the most violent typhoon in Japanese history struck his native Nagoya at night. His family’s concrete house stood firm as the wooden structures around them collapsed. In pitch black, he and his father managed to pull in 36 people from the floodwaters through a second-floor window, saving their lives. Gold Medalist Jun Kaneko in his studio. Like so many accomplished artists, he personifies focus. 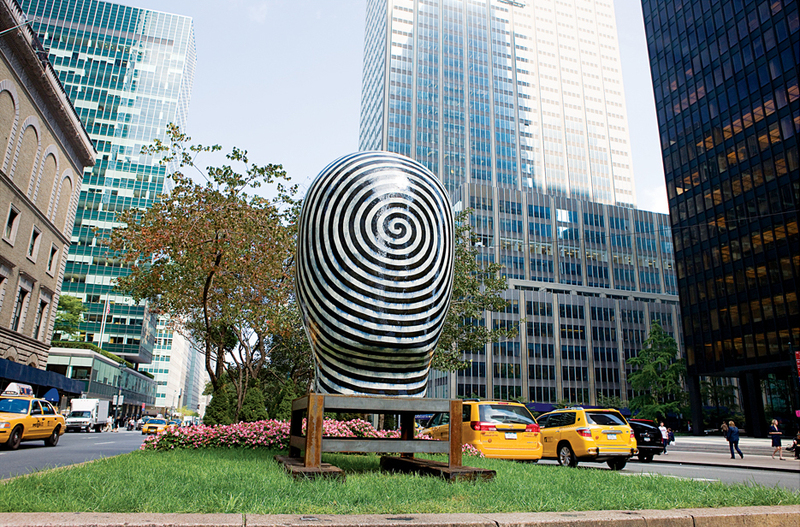 A Kaneko Head on New York’s Park Avenue, part of a 2008 public art installation that included several other Heads placed throughout the city. 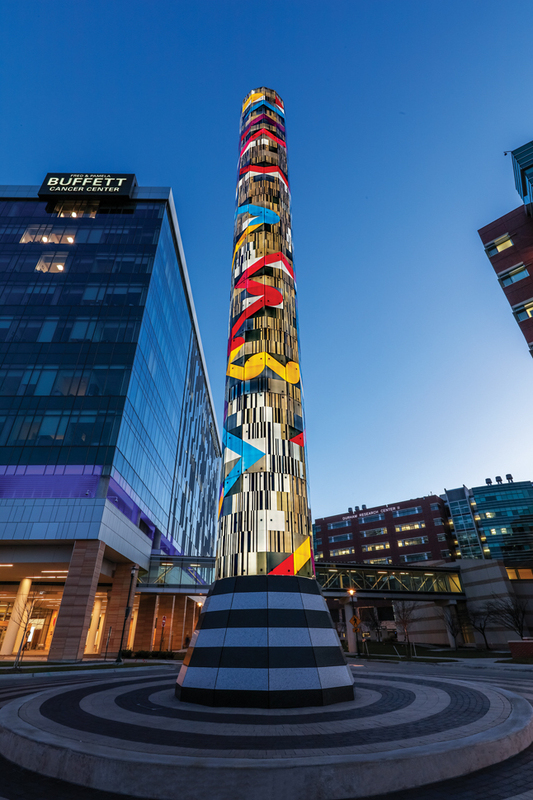 Kaneko’s glass Search (2017) towers over an Omaha hospital. The artist designed the black-and-white patterns without reference; he realized they resemble human chromosomal diagrams only after a doctor excitedly pointed it out to him. 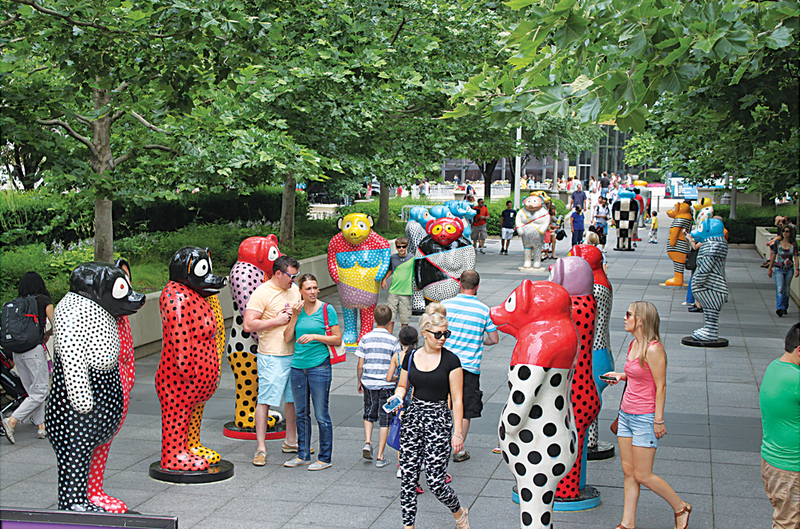 Dozens of Tanukis lined Chicago’s Millennium Park in 2013. The tanuki, a kind of wild dog, is viewed in Japanese mythology as a trickster that can wreak havoc but also bring good luck. 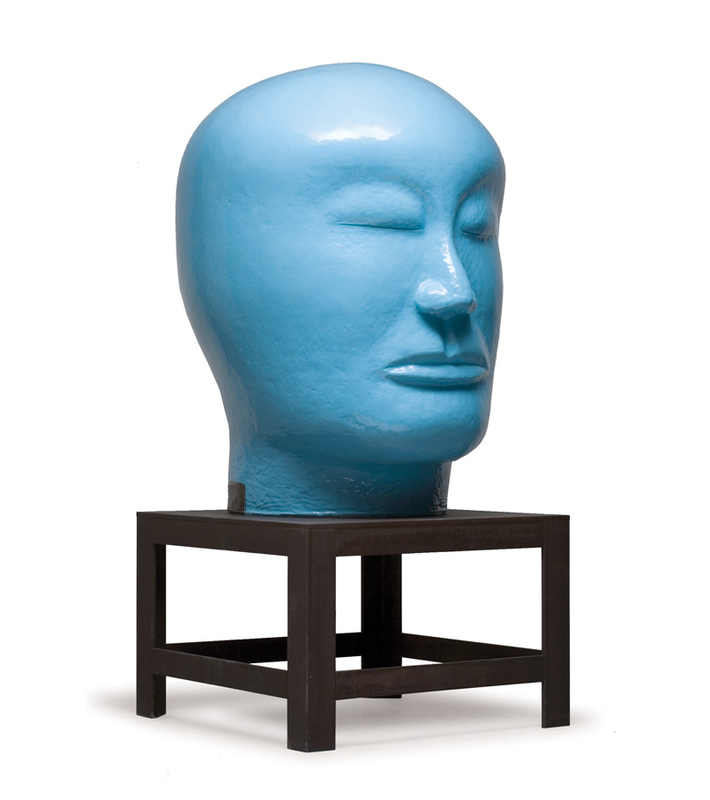 Untitled, Dango, 2009, ceramic, 6.8 x 2.5 x 1.5 ft.
Untitled, Dango, 2009, ceramic, 6 x 6.7 x 2.3 ft.
Untitled, Dango, 2017, ceramic, 3.2 x 2.2 x 1.4 ft.
Head, 1995, ceramic, 8.3 x 4 x 4.25 ft.
Untitled, Dango, 2018, ceramic, 7.4 x 2.4 x 1.5 ft.
Kaneko cites not ambition or planning but “pure accident” for the way much of the rest of his life has taken shape. Landing in Los Angeles in 1963, he ended up house-sitting for Fred and Mary Marer, serious collectors of contemporary American ceramics. He was amazed at their modest home, crowded with hundreds of objects. “It was completely jammed,” he recalls. “Ceramic plates and pieces are all over the floor.” The idea that they were worth collecting was equally amazing. Though handmade teapots and vases were common in Japanese homes, this body of work was different. It was an art form. “It really did influence and shock me,” he says. 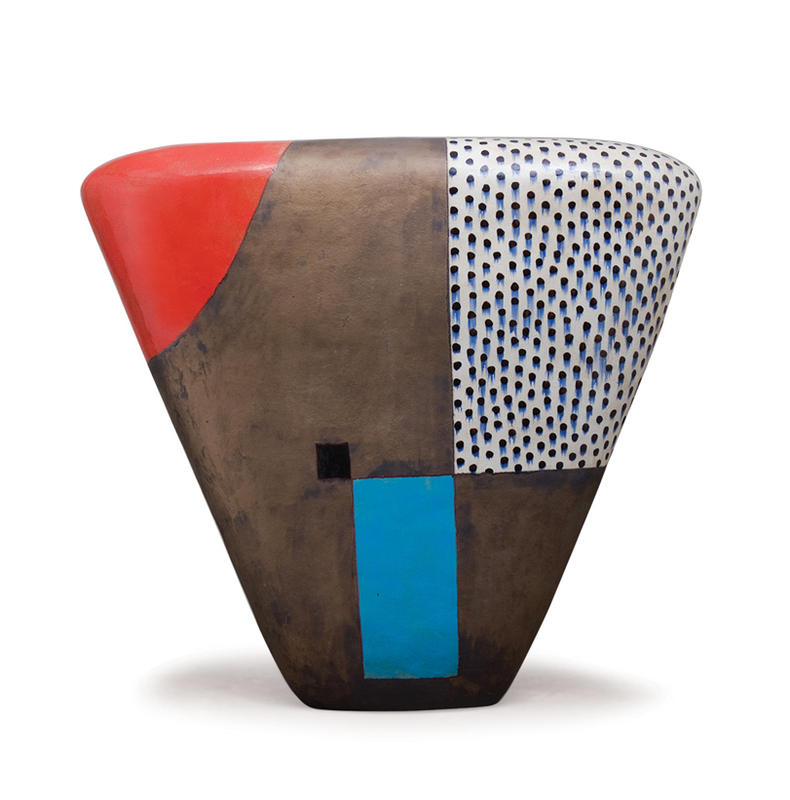 “And I said to myself, ‘I should try this.’ ” Fred Marer introduced him to some of the prime movers of midcentury California ceramics – John Mason, Henry Takemoto, Ken Price, Billy Al Bengston, and Peter Voulkos; Voulkos, along with Paul Soldner, became his teacher. At the time, he didn’t know how remarkable these men were. And he didn’t see it coming, but ceramics became his passion. Even meeting his devoted wife and partner, Ree, happened serendipitously. In 1982, he was driving with a friend to Canada. As they neared Pilchuck Glass School in Washington state, Kaneko suggested they stop and say hello to Dale Chihuly. At Pilchuck he met Ree Schonlau, who was taking classes there. She invited him to come to Omaha to join her workshop for artists who wanted to make work in an industrial setting. He’d been teaching at Cranbrook Academy of Art but had been thinking about moving and becoming a full-time artist. Omaha suited him; it was quiet, and there were old warehouses available at reasonable prices. He’s been there for 32 years. 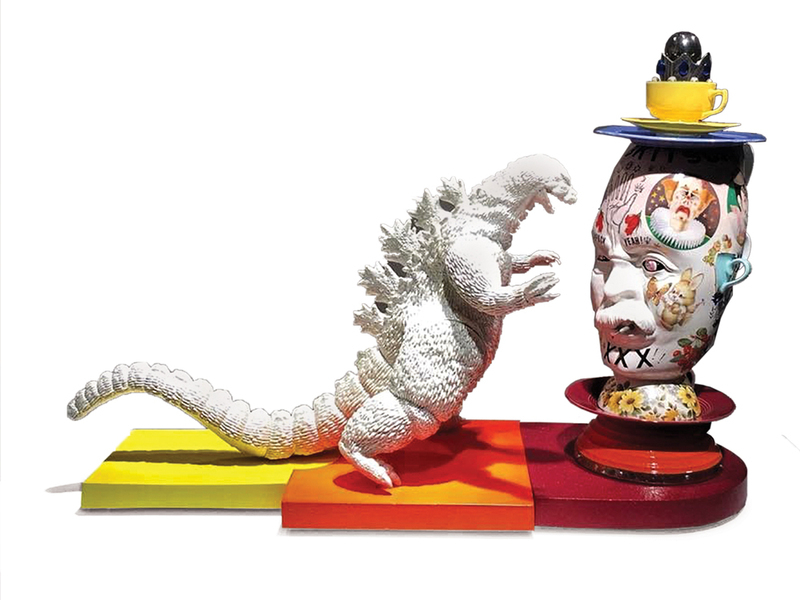 Kaneko’s portfolio is not the result of striving and calculation, but rather the unfolding of a steady, irresistible impulse he trusts but can’t really explain. His ideas don’t strike like lightning; instead, every idea comes gradually into focus. 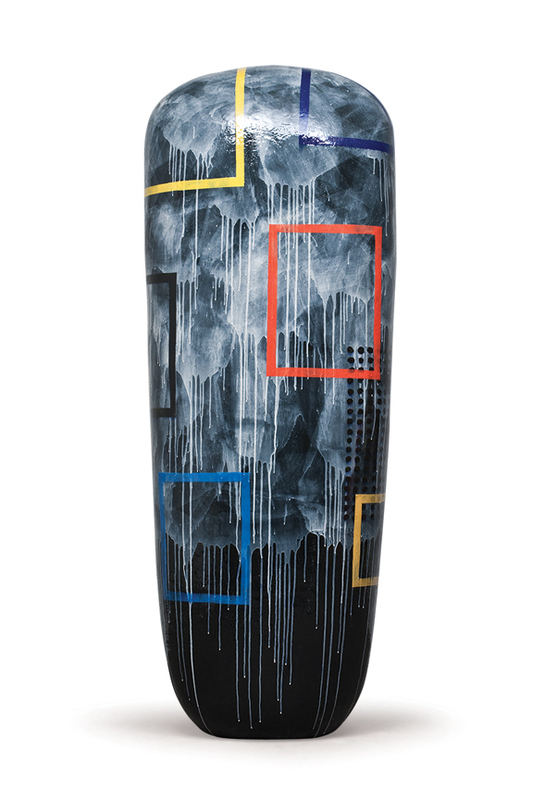 Kaneko’s manner is gentle, but his drive is clearly relentless – and he counts on that. It’s his heartbeat, keeping him alive. “I’m following my intuition,” he says, “so my biggest worry is to run out of this desire of making pieces. If I lose that, that’s it.” He fears not a typhoon or a tornado but losing his life force. He may not understand the force or control it, but he treasures it: “Every day, you’re excited, and then you can’t wait to go to the studio. If you’ve got that basic thing resolved, then you’ve got it made.” So far, so good. Consider that his father could be abusive, so young Burns and his sister steered clear. Burns spent hours in his bedroom drawing and making things. “In my real life, I couldn’t control what was going on, unless I went into a room and shut the door,” he recalls. It was the middle of the 20th century, Vampira was on TV pitching horror movies, and for 90 cents, you could pick up a kit to build your own plastic Dracula or Frankenstein. Burns became transfixed by monsters and along the way learned a lot about building figures on bases. “I’ve been making monster models for 47 years,” he points out. 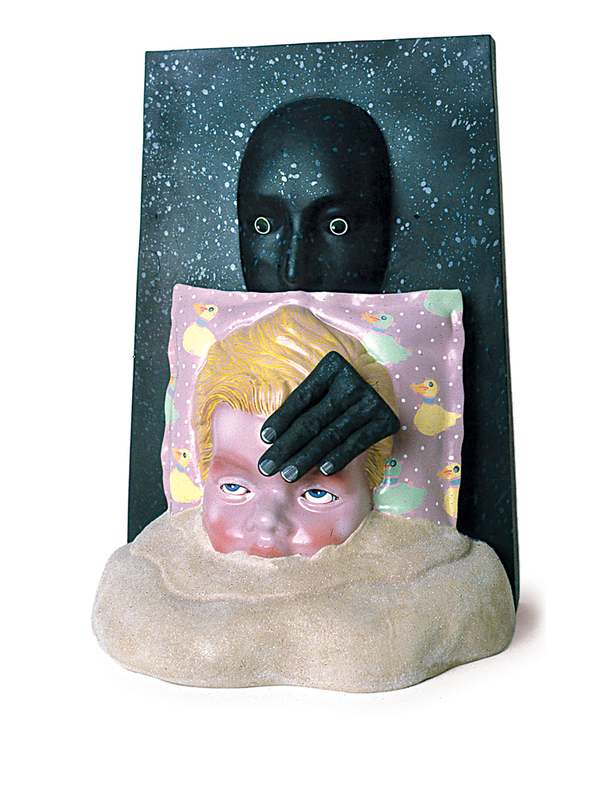 Much of Mark Burns’ work is cheeky and playful, but some pieces, such as Sandman (1980), are darker, exploring the secret fears of childhood. In Godzilla vs. Kingkitsch (2017), Burns (or his likeness, anyway) squares off against the movie monster that terrorized Tokyo. Plague in Red (Poe/Price) (2017) commemorates a fictional pestilence created by Edgar Allan Poe and immortalized in film by schlock-horror actor Vincent Price. If you want to appreciate Burns’ monsters, know that, when he landed at the University of Washington for grad school after earning his BFA at the School of the Dayton Art Institute in Ohio, his eyes opened wide. There he was – “just some guy from a cornfield” – working alongside Howard Kottler, Patti Warashina, and Robert Sperry. It was the funk period, unconventional work in clay was in vogue, and in that hotbed, Burns began to find his own, thoroughly quirky, voice. Not that he dove right into making his own multilayered sculptural works. There were teaching jobs and, more important, the honing of his mad craft skills, which happened when Burns worked in the early 1980s for a Philadelphia art restorer, repairing broken braids on old Hummel figurines and the like. In that job, he had to work in an array of styles – the boss didn’t want his version of a Dresden milkmaid’s arm, he wanted a Dresden version – under strict deadlines. “I’d come in, there’d be maybe 50 objects on my tables, and each thing had a piece of tape on it with a number, and if it said ‘5,’ that’s how many minutes I got to rebuild what was missing.” Some days he did nothing but replace tiny fingers. The training was amazing; “I should’ve been paying them,” he quips. Later on, keep in mind, Burns spent more than 20 years at the University of Nevada, Las Vegas, teaching and running the art department, surrounded by all that Vegas kitsch in that most American of cities. He retired in 2012. If you want to understand Burns, 67, forget about the deference of some artists toward their materials. He views clay “as an inert material that I didn’t feel any sort of spiritual or emotional connection to, no more than I did Play-Doh, or papier-mâché, or cardboard boxes glued together to make forts as a child.” And don’t check the work for the mark of the hand. 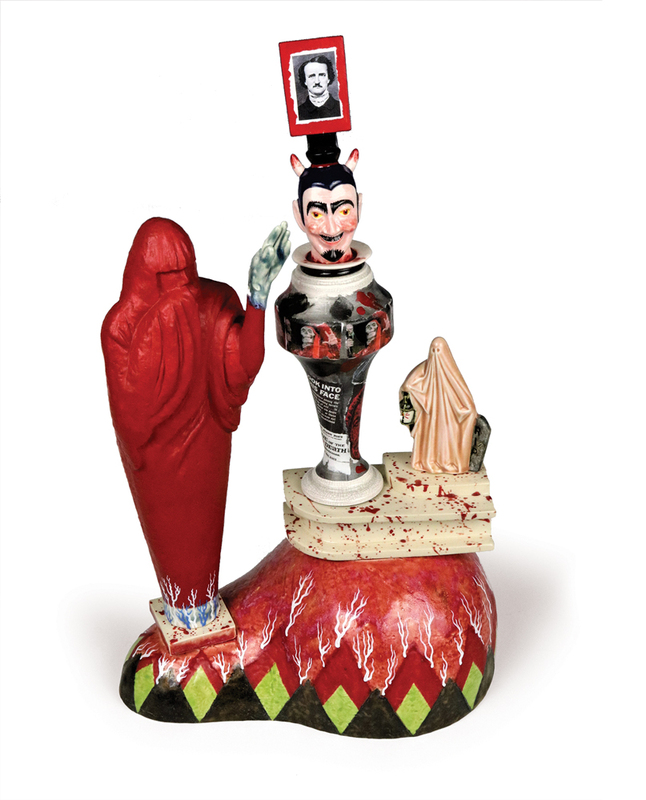 Burns is partial to the anonymity of “the knickknack, the cheap souvenir – those things have an energy all their own,” he says. When you look at one of Beth Lipman’s over-the-top still-life installations, you can almost feel the carnival spirit of a raucous banquet. You might faintly hear the noisy chatter, the clinking of glasses, the ritual laughter, the toasts and the asides. You can imagine the excesses of all the moments through the ages when prosperous people, throwing off all restraint, have come together to celebrate. Glass “is always capturing a moment in time,” Beth Lipman says. Her installations are kind of ghost tableaux, with everyday objects standing in for human presence. Secretary with Chipmunk, 2015, wood, glass, ash, gold, brass, mirror, sugar, salt, adhesive, 8 x 3.4 x 1.7 ft. 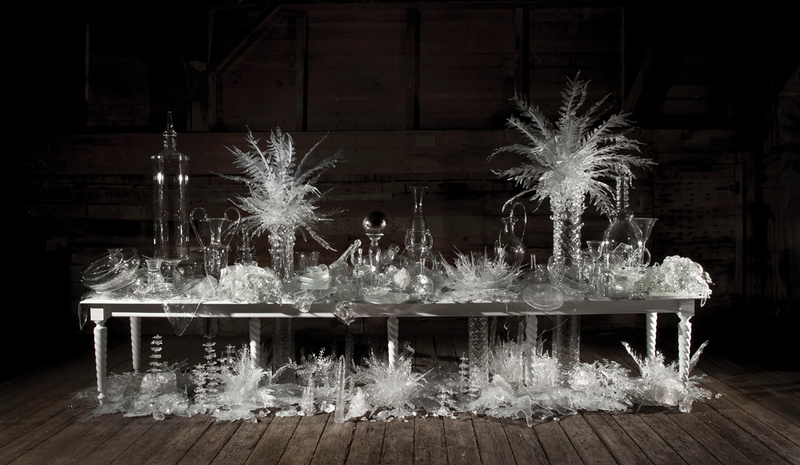 Laid (Time-) Table with Cycads, 2015, glass, adhesive, wood, paint, 7.7 x 16 x 4.75 ft. Her chosen medium records history in its own way. “The interesting thing about glass,” she says, is that “it is always capturing a moment in time. It retains every mark and every moment and movement.” The process is always revealed in the product. Today, she’s got her own children, who enjoy spending time in her studio and that of her husband, Ken Sager, who works with leather. “My daughters love to make things,” she notes. As it does, history could be repeating itself. When Mary Jackson looks back on her 73 years, she is amazed. 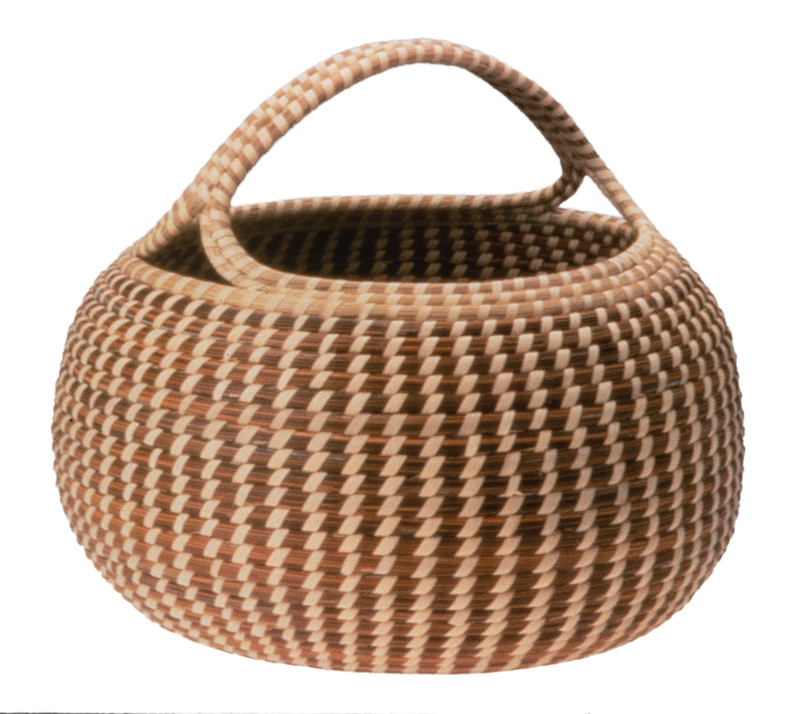 She never expected to be a celebrated basketmaker with works in museum collections around the world. She never dreamed she’d count Prince Charles of England and Empress Michiko of Japan among her collectors. When she got the call in 2008 telling her she’d won a $500,000 MacArthur fellowship, she was so taken aback, she says, “I nearly fell down.” And when the Gibbes Museum of Art in her native Charleston, South Carolina, opened the Mary Jackson Gallery in 2016, she was floored. “That’s an honor that’s just hair-raising,” she says. 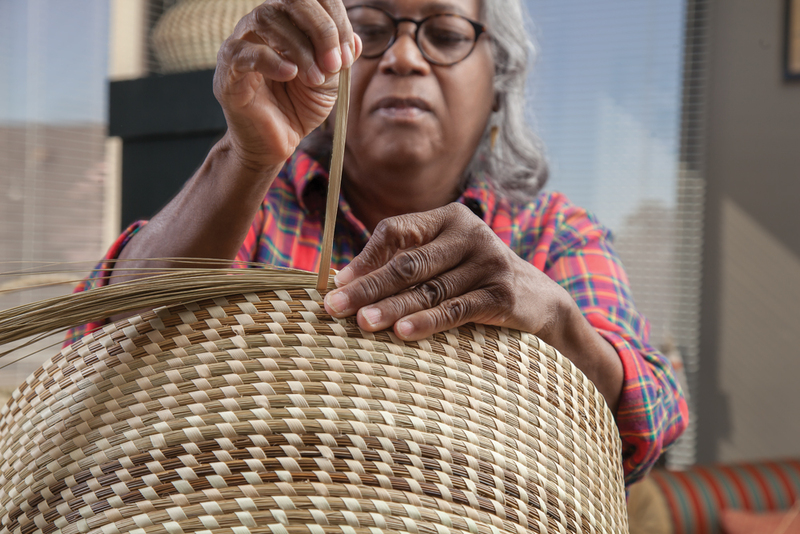 Mary Jackson uses sweetgrass, pine needles, palmetto, and bulrush to make her distinctive baskets. These measure from 7 inches to about 17 inches high. As a young woman, Jackson worked as a secretary. But when her baby boy (now 38) was diagnosed with chronic asthma, she quit work to be at home with him. 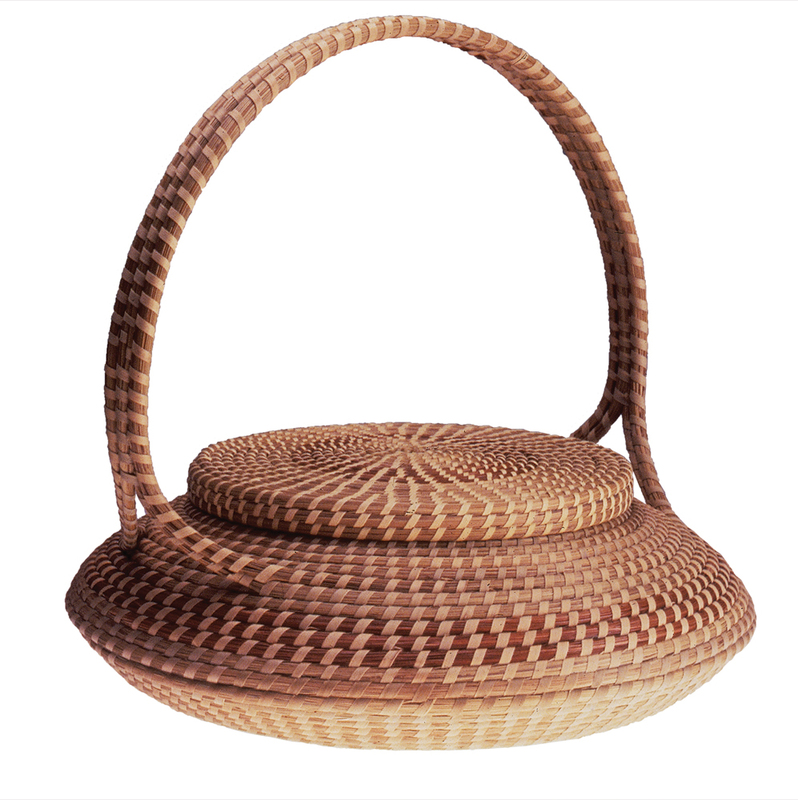 She began making baskets again to bring in extra money and quickly made a name for herself by innovating on classic sweetgrass basket designs. Her unusual baskets were “a big success overnight. I had no idea,” she says. In 1984, she was invited to show her work at the Smithsonian Craft Show. Her reputation grew from there. She’s also had to worry about the supply of materials. She spent about 10 years working with a Clemson University horticulturist, the Charleston mayor, nurseries, and landowners to propagate new sweetgrass plants because development was wiping out the habitat. As a result, sweetgrass is more plentiful today. 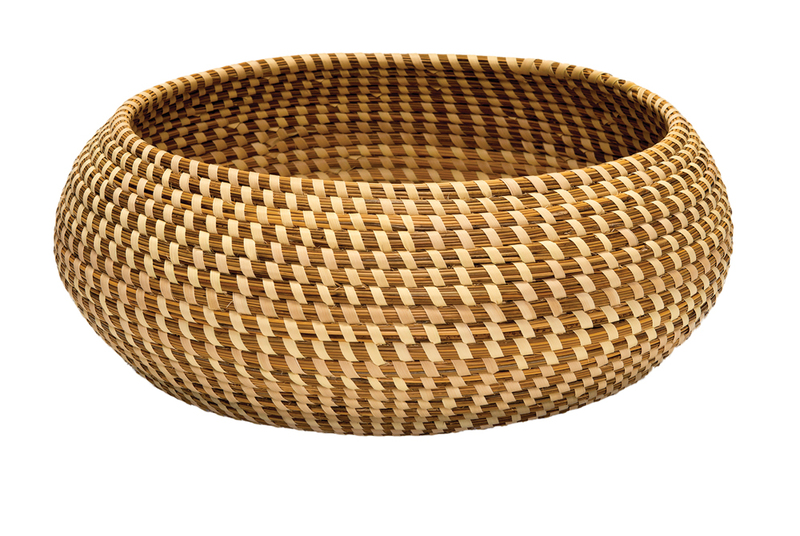 But she wonders if children will want to devote themselves to basketmaking. “There are a lot more opportunities for them than there [were] for me,” she says. A Thomas Gentille brooch is at once compressed and expansive, instantly recognizable and ultimately mysterious. Over a few square inches, one of Gentille’s pieces might present something like tilled pastureland, only in bright yellow and burnt red instead of green and brown, or a miniaturized high-rise tipped on its side, or Arctic water showing through cracked ice. They demand further study of the geometry of the lines, the interplay of the hues. 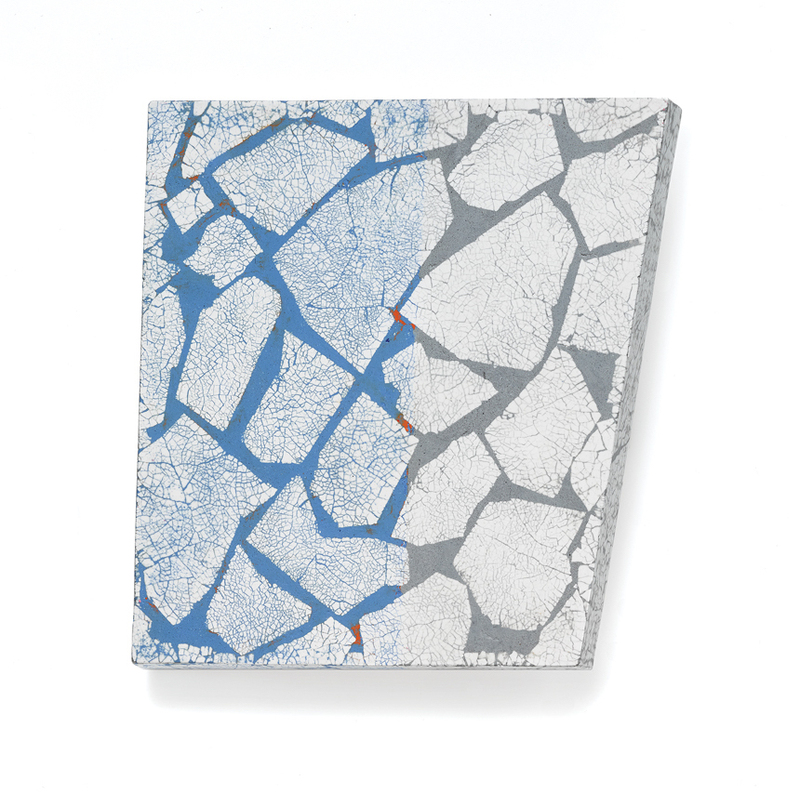 Pin: Eggshell Inlay, 21st century, eggshell inlay, 3.75 x 3.5 in. 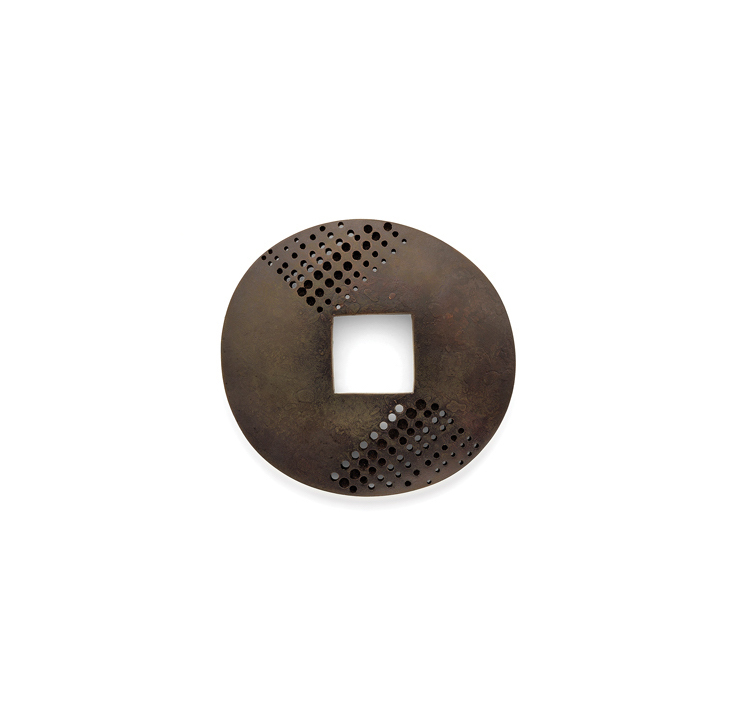 Pin, 20th century, copper, 14k gold, 2.8 in. dia. Pin, 21st century, maple, polychrome, metal, 6 x 1.4 x 1 in. Since she was 9 years old, Consuelo Jimenez Underwood has had a plan. Just before she entered her second decade, she looked at the world around her and contemplated her options. Born in Sacramento, California, to a large family of migrant agricultural workers – she’s the second youngest of 12 – Underwood spent her youth picking fruit during the summer and into the school year. Her mother was a fourth-generation Mexican American, her Wixárika (Huichol Indian) father an undocumented laborer who arrived to the US knowing no English. Even at an early age, Underwood realized that her family was at the bottom of the socioeconomic ladder. She understood that her classmates had more money and time – and therefore more opportunities – so she formed a “speed plan” to get ahead: “When you can walk, run. If you can run, fly – because you’ve got to catch up.” With in 10 years, she told herself, she would be the first in her family not only to attend high school, but also to earn her diploma and leave the migrant workforce. 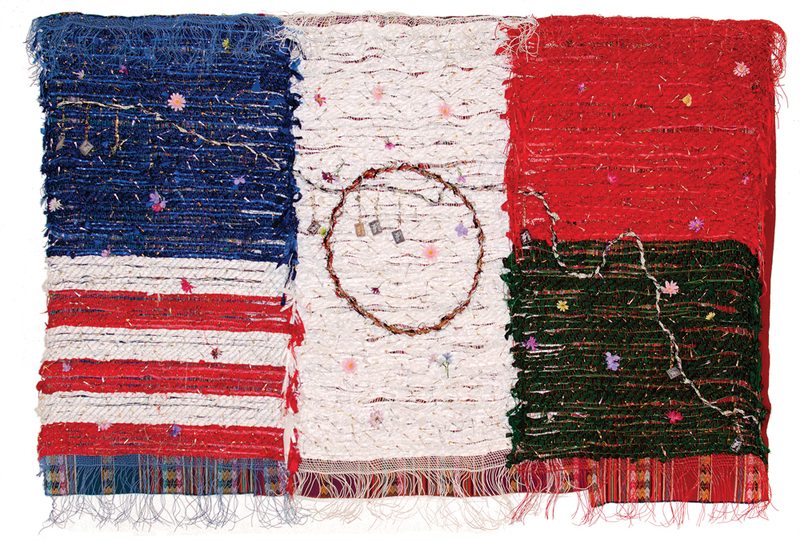 Consuelo Jimenez Underwood’s textile work often explores how borders affect people and the planet. American Border Charge: Power Wands and a Basket, 2018, fiber, mixed media, 15 x 26 ft.
Home of the Brave, 2013, fiber, wire, silk, safety pins, 6 x 8.25 ft. Mother Rain Rebozo, 2017, linen, wire, silk and wool thread, 5.5 x 1.25 ft.
That was the start of her setting 10-year goals. 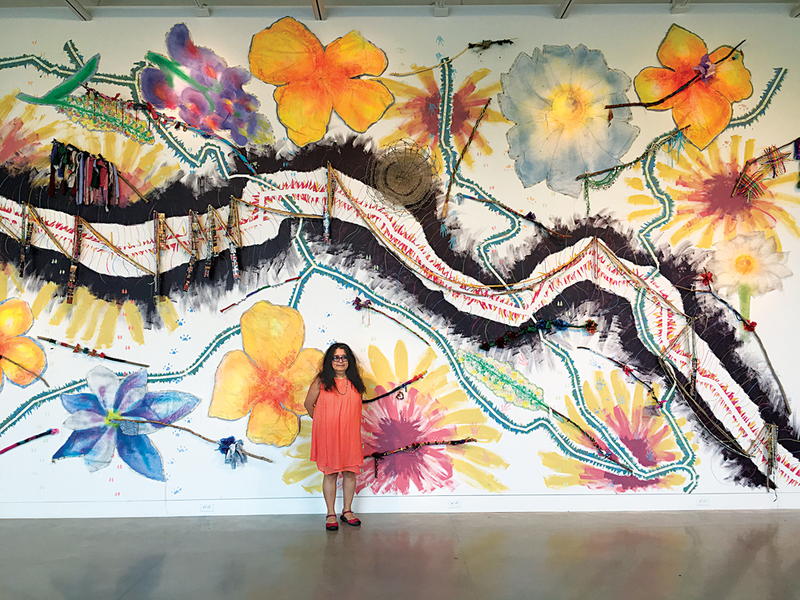 Every time the artist crosses into a new decade, she takes stock: In her 20s, she focused on raising a family of her own and supporting her husband, Marcos, while he got his degree. (“And meanwhile, I would just embroider everything that I had in the house.”) By 30, she had turned her attention back to herself and started college. 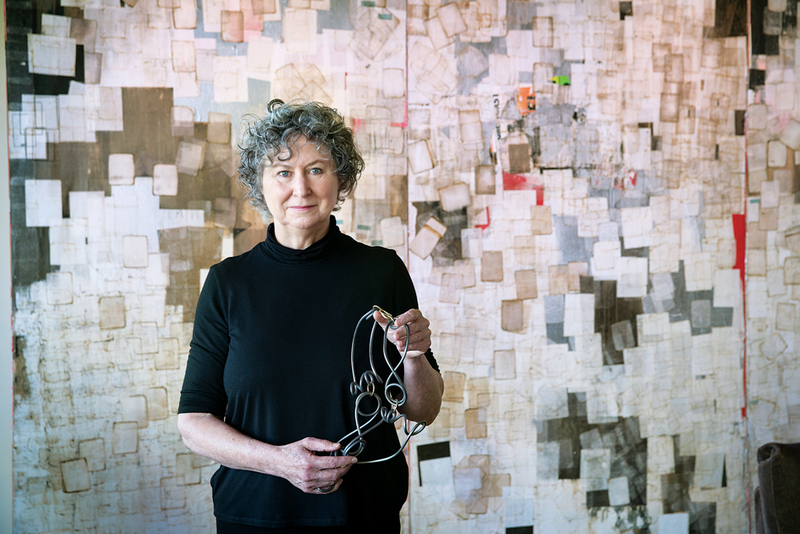 By 40, she had earned three degrees: a BA and MA in art from San Diego State University and an MFA from San Jose State, where, by 50, she had become the art department’s head of fiber and textiles. Underwood also raised her profile in the art world – the Renwick and the Museum of Arts and Design, among others, acquired her work. By 60, she decided to leave teaching to focus on her own art – and to make up for lost time. Her mixed-media weavings and installations look at the world through her tricultural perspective, aiming to deepen empathy. “I’d like my work to have a positive effect on a negative reality,” she says. Her work amplifies the voices of those who often aren’t heard, including undocumented families crossing the US-Mexico border in search of refuge and the countless nameless women behind centuries of textile craft. “I think that’s so cool that I have this opportunity to be a conduit for these voices,” she says. Thomas Hucker’s furniture bears his unmistakable experimental style, but it also reflects the tradition-rich training that he says is critically important. 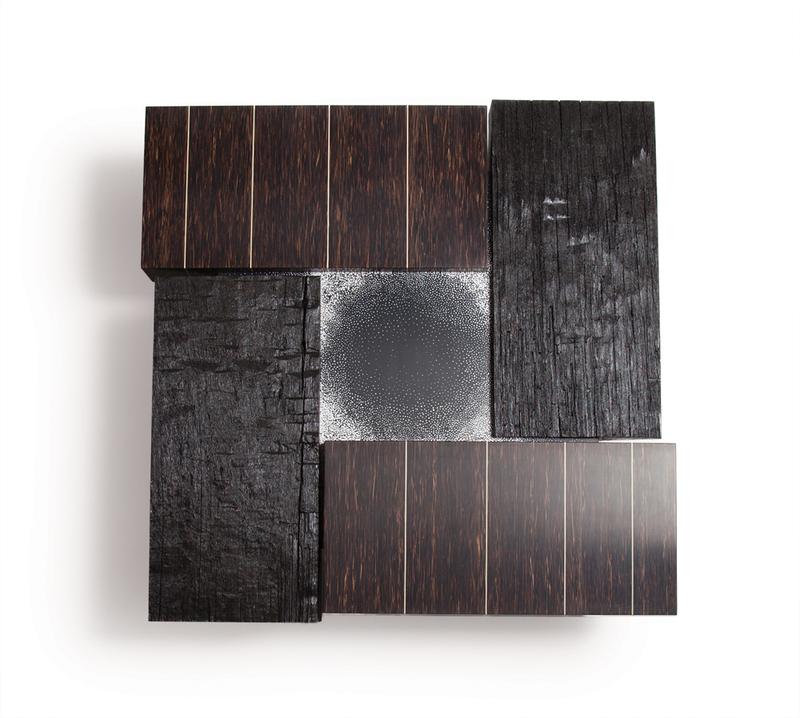 Ledge Table, 2016, ebonized white oak, black palmwood with holly inlay, eggshell lacquer, 3.5 x 3.5 x 1.5 ft. 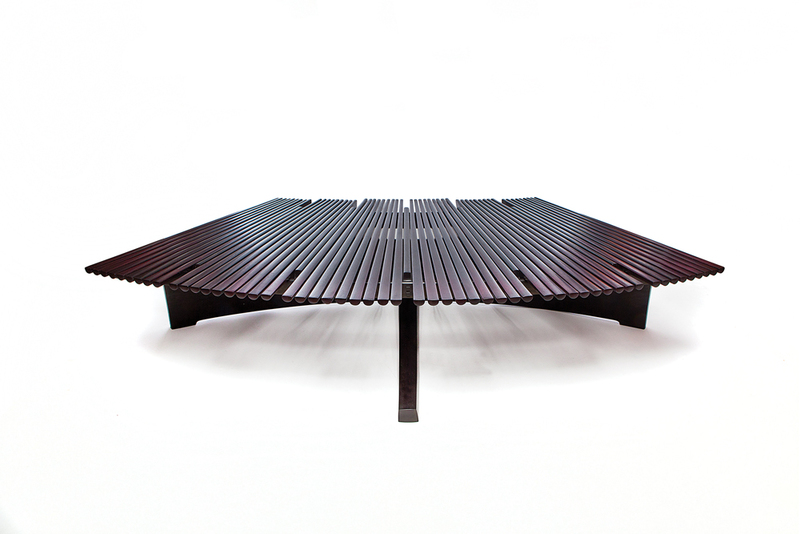 Fan Table, 2016, purpleheart, ebonized mahogany, 1.5 x 5.8 x 3.3 ft.
Walnut Rocker, 2010, American black walnut, 3.3 x 1.7 x 2.8 ft.
Over more than four decades, Hucker’s work has displayed his classical training even as it honors his more experimental instincts. 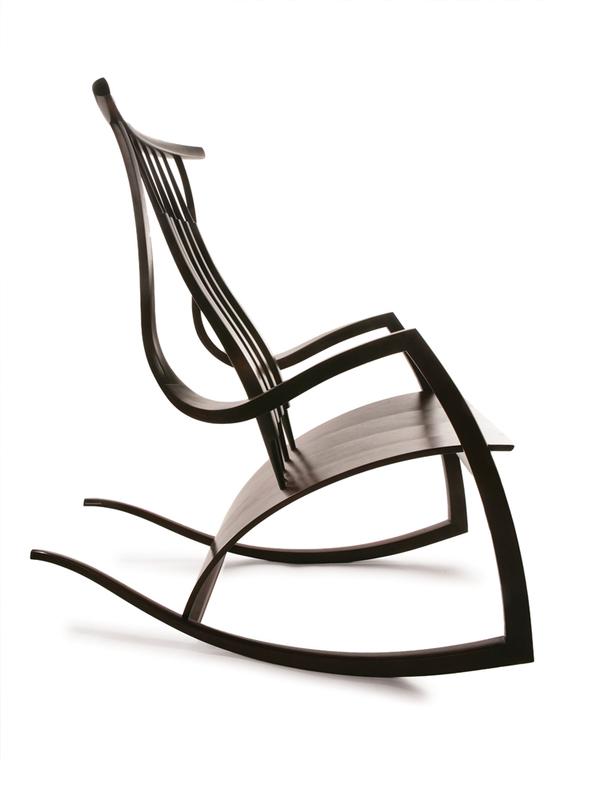 The surfaces of his chairs, tables, and sofas may swoop, swirl, or splinter, but they’re all underpinned by a precise, time-honored framework. He still favors music metaphors; he admires artists who make pieces he likens to the conceptual music of John Cage, but he considers himself more akin to a jazz musician, with a beat and a melody hidden within the improvisation. “You still may want to tap your foot or smile,” he says. Hucker has lived in the New York City area for most of his professional life (he’s now in Hoboken, New Jersey), and as the region becomes less and less affordable, running a furniture studio presents a growing challenge. Hucker admits he sometimes envies his peers who opted for more rural locales. 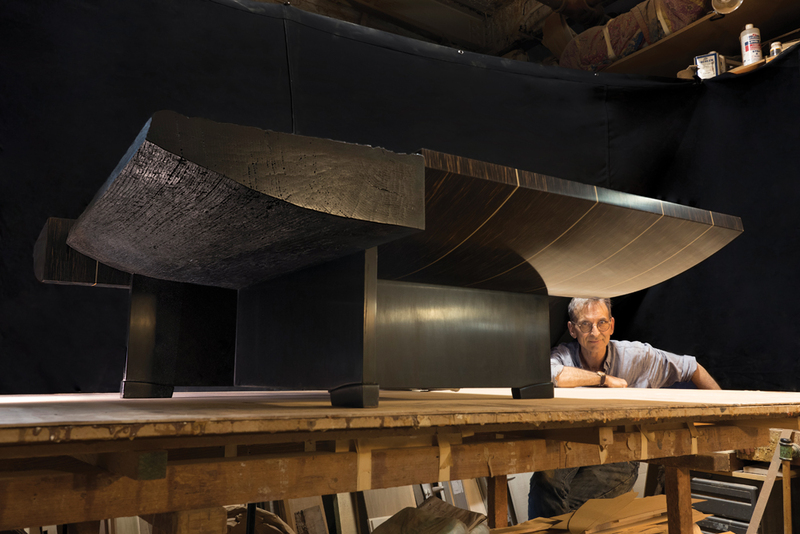 “I’ve felt like a freak here,” he says, “because being a woodworker in New York? It’s an oxymoron.” Still, the environment full of artists and thinkers has nourished him. As a fiber artist, Yoshiko Iwamoto Wada pushes boundaries; as a scholar and teacher, she works to preserve traditions. 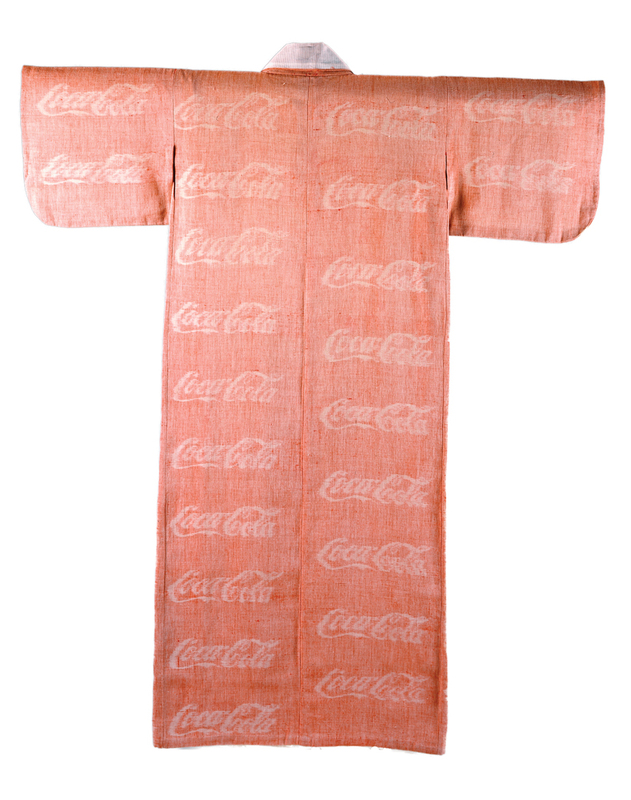 Coca-Cola Kimono, 1975, cotton, 5.2 x 4.1 ft.
A young Wada stands in front of her grandmother (far left), an early supporter of her artistic interests, in a 1949 family portrait in Kobe, Japan. She credits the women in her family for instilling in her a love of art and textiles. 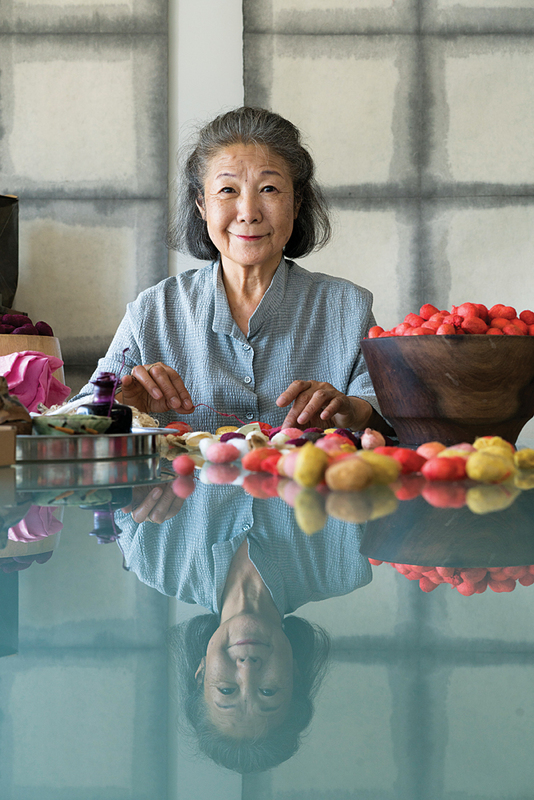 Wada came to her reverence for textiles as a child in Japan. “I was lucky to grow up still seeing the remnants of the old kimono practice,” she says, and the form remains vital to her own artwork. Her paternal grandmother, who arranged private art lessons for Wada when she was about 6, opened one of the first Western dressmaking schools in Tokyo. 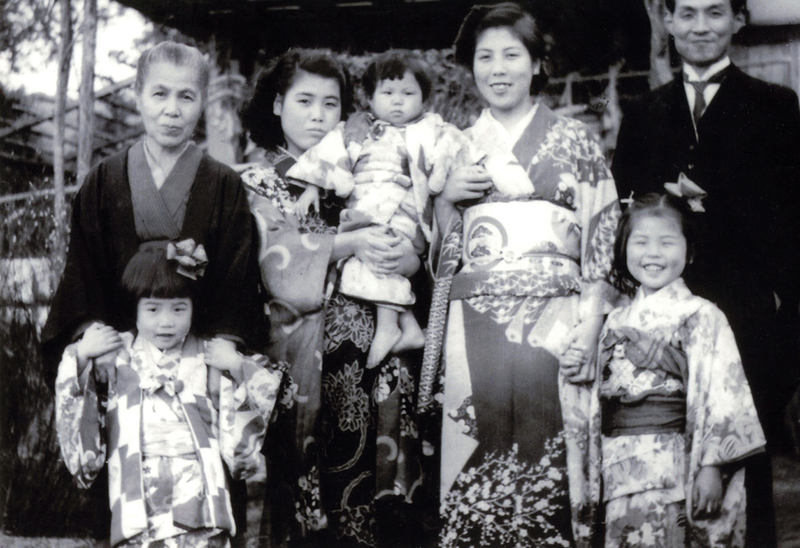 Her maternal grandmother was also attuned to fabrics, sewing, and mending – boro, as it’s called in Japan. Wada remembers rummaging through that grandmother’s box of silks and finding treasured clothes made even more beautiful by their “exquisitely patched” repair. And she recalls visiting “fabulous fabric shops” in her hometown of Kobe with her mother and her sisters, choosing materials for outfits her mother would sew. Those trips nurtured their love for textiles, she says. Now Wada, 74, worries that children and parents and grandparents don’t come together around textiles much anymore. Today, “mothers are too busy, and they don’t know, or they haven’t had a chance to learn it from their mothers.” That loss of generational learning has fueled her art practice, her teaching, the shows she’s curated, the four books she’s authored, the Natural Dye Workshop films she’s produced, and the textile-based organizations she’s founded. Wada is keenly aware that the world of kimonos, handmade clothing, and careful mending is disappearing. But there are skills and traditions that must be preserved. Over the years, she has traveled the world to study traditional ikat, shibori, kasuri, and other forms of resist-dyeing, leading many tours to Japan, India, France, Italy, and China. And, since 1992, she has spearheaded the International Shibori Symposium, which has drawn textile enthusiasts from around the world to Mexico, Australia, and Chile, among other far-flung locales. Besides her election to the ACC College of Fellows, Wada received the 2016 George Hewitt Myers Award from the George Washington University Museum and the Textile Museum, recognizing a lifetime of exceptional contributions to the field of textile arts. “We’re losing connection with that past and the richness of textiles,” she says. Through her energies on many fronts, she’s helping to keep it alive and vibrant. Looking at Susan Cummins’ early life, you might not guess that she’d become one of the most respected art jewelry advocates working today. She began as a student of fine art at Scripps College after a summer in Paris, London, and Florence. She’d seen world-famous paintings, sculptures, and architecture and wanted to learn more. She earned her art history degree in 1969 and about five years later opened a shop in northern California that sold pottery by her then-partner Beth Changstrom, as well as craft in other mediums. She didn’t start buying art jewelry until the mid-2000s, and rarely wears it even now. “It isn’t my style,” she says. Susan Cummins with a 2017 neckpiece by Dorothea Prühl. Cummins’ gallery was among the first in the US to focus on American art jewelry. She later founded Art Jewelry Forum. 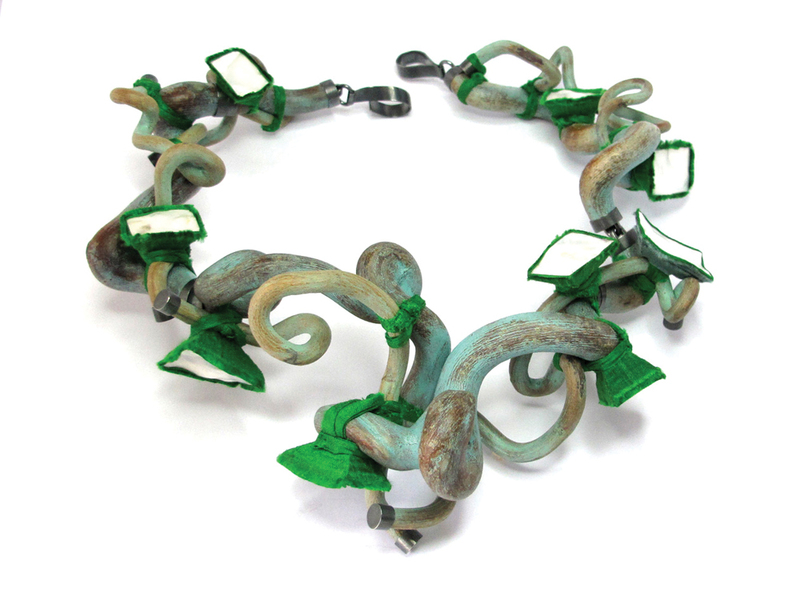 Terhi Tolvanen, Chez Marie in the Park, neckpiece, 2018, corkscrew hazelnut, raw silk, oyster shell, paint, silver, 9.5 in. 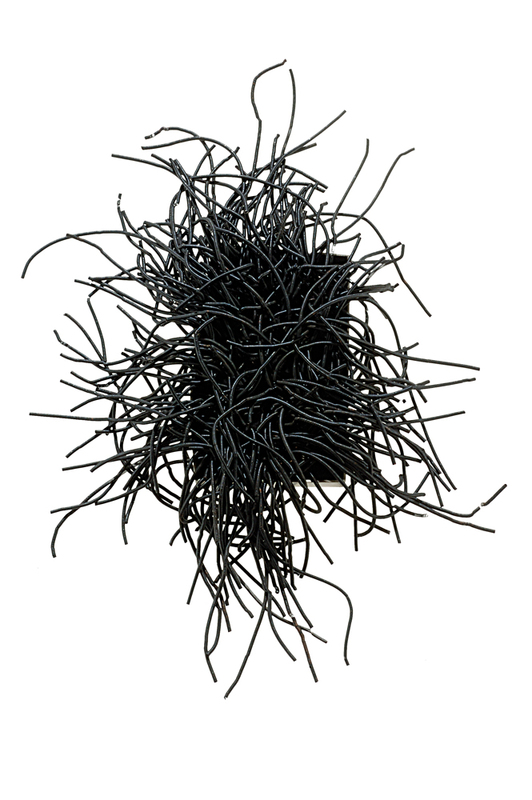 Kadri Mälk, Medusa 2, brooch, 2004, darkened silver, rubber, springs, 3 x 3.5 x .75 in. You could say Cummins, 71, came to focus on jewelry almost by process of elimination. 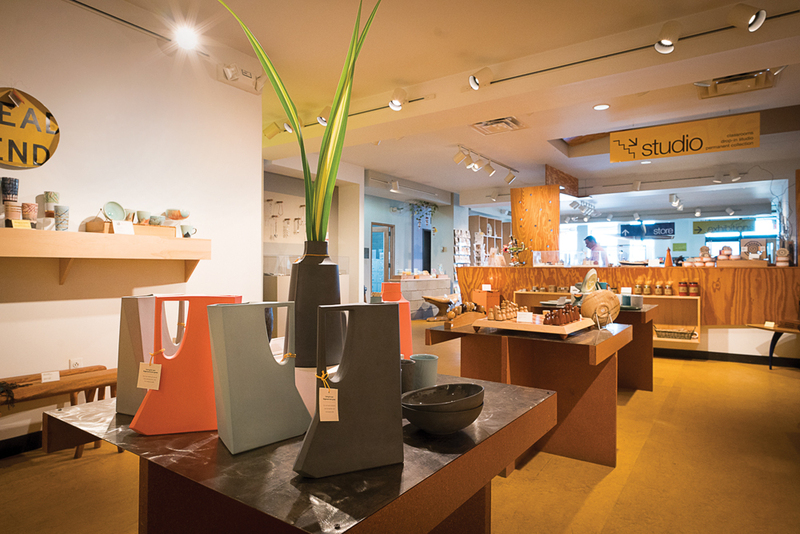 In the early 1980s, she and Changstrom moved into a new gallery space in Mill Valley. They planned to exhibit several craft mediums, but there was too much local competition in ceramic, fiber, and glass. Almost nobody on the West Coast was offering jewelry, however, and the few East Coast jewelry galleries focused on European work. “So I decided, ‘All right, I’m a West Coast person. I’m just going to show American jewelry.’ ” That was the birth, in 1984, of the Susan Cummins Gallery. The gallery became known for its innovative exhibitions and displays. 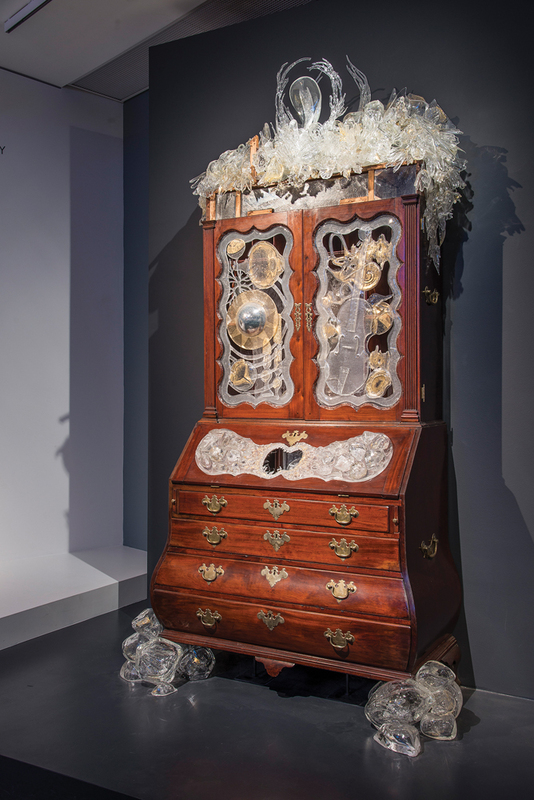 The show “Jewelry as an Object of Installation” featured Bruce Metcalf, David and Roberta Williamson, and Kiff Slemmons, all of whom were making jewelry on a stand or as part of a vignette with other objects. Cummins especially loved displaying small paintings with like-minded jewelry pieces. Today, Cummins, now living in Tiburon, California, with partner Rose Roven, is working on a book about jewelry made in the tumultuous 1960s and ’70s. What fascinates her about jewelry after all these years? First of all, because it’s relatively small and worn on the body, it’s artistically challenging to make. 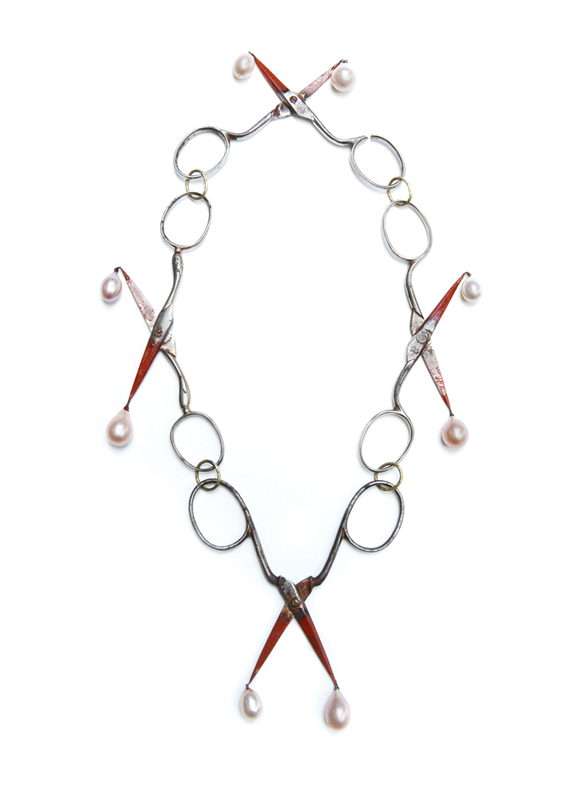 “I like the limits jewelry imposes on the object,” she says, “and I love to see what an artist can do within those limits.” Second, in her favorite kind of work – what she calls “power jewelry” – she sees the weight of history. “It often has an overlay of a symbolism, a mystical or magical or spiritual quality, which I think the first jewelry had,” she says. “It has a conviction about it.” With her decades of devotion to small, beautiful, meaningful objects, this Honorary Fellow also radiates conviction. Tacked on a board in Janet McCall’s office is a well-worn sheet posing two vital questions: “What change can we make in the world?” and “What difference can Contemporary Craft make?” Those two queries drive the Pittsburgh art organization, where McCall is executive director. Its artist- and community-focused initiatives include award and exhibition opportunities for makers, a shop selling their work, cutting-edge shows examining pressing social issues, artist residencies at local middle schools, on-site studio classes, maker programs serving homeless youth and nursing home residents, and an apprenticeship for emerging black arts administrators aimed at diversifying the leadership of art organizations. By showing work that reflects a variety of perspectives in its brick-and-mortar space, located in the city’s Strip District, as well as at their satellite gallery in a busy downtown light rail station, the organization also aims to help people of all walks of life – whether or not they have a background in art – relate across difference. Engagement is a big part of their mission. “We’re not here to hold forth as art experts,” McCall explains. “We’re really here to provide an opportunity for conversations and discovery and making, together.” One way is through their biennial social justice initiatives, traveling exhibitions examining sensitive issues. Since 2013, the organization has mounted three shows on difficult topics – violence, mental health, and homelessness – working with experts in each field. Accompanying materials – free, hands-on, artist-designed projects, curriculum guides, and lists of outside resources for further learning – help audience members leave the show feeling empowered. “Our hope is that every person coming in to see one of these social justice shows will go out the door thinking, ‘There’s something I can do,’ ” McCall says. 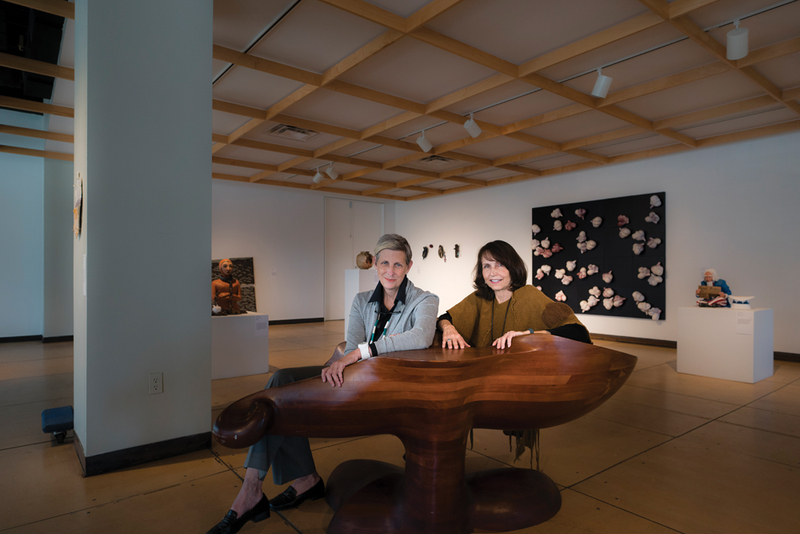 Contemporary Craft director of exhibitions Kate Lydon (left) and executive director Janet McCall in a Wendell Castle chair. Founder Betty Raphael was an early supporter of the artist. The nonprofit started as a pop-up shop in 1971. It continues to sell the work of notable makers. 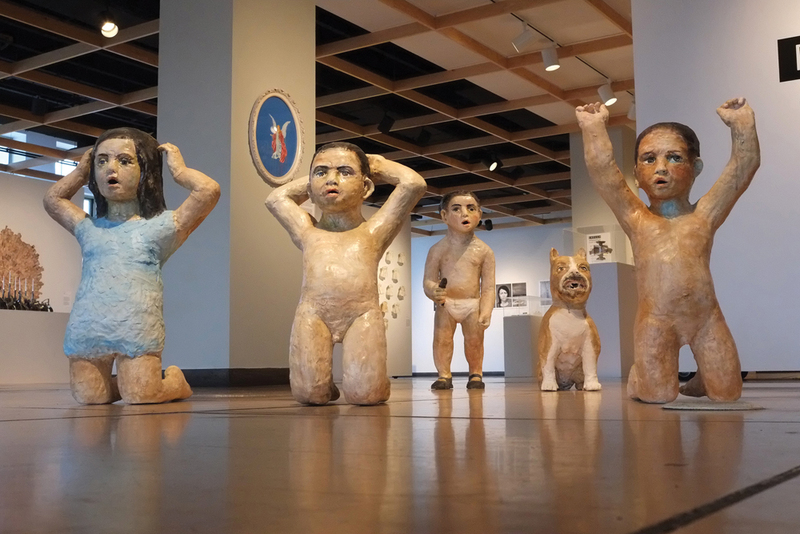 Claudia Alvarez’s Perro Pendiente installation at the entrance of the 2013 exhibition “Enough Violence: Artists Speak Out.” By exploring social topics in their shows, Contemporary Craft hopes to be a place for conversation, healing, and change. 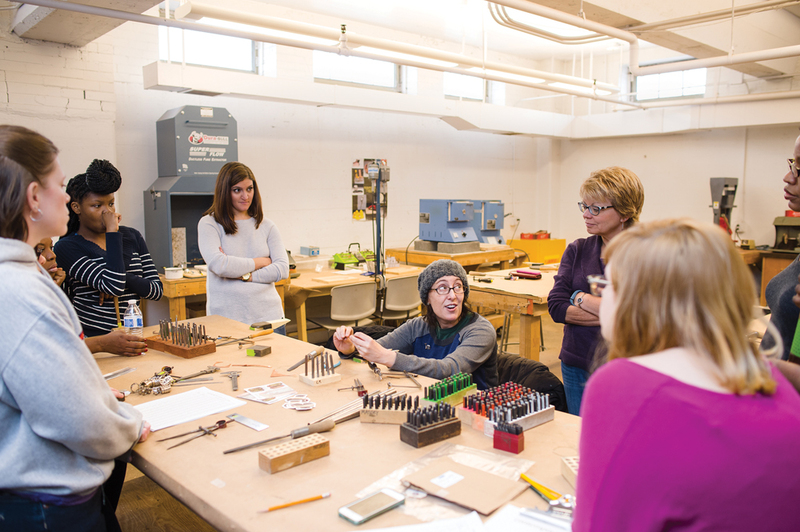 Craft classes round out the programming and help support local makers. In South Bend, Indiana, Miller’s childhood revolved around sports. 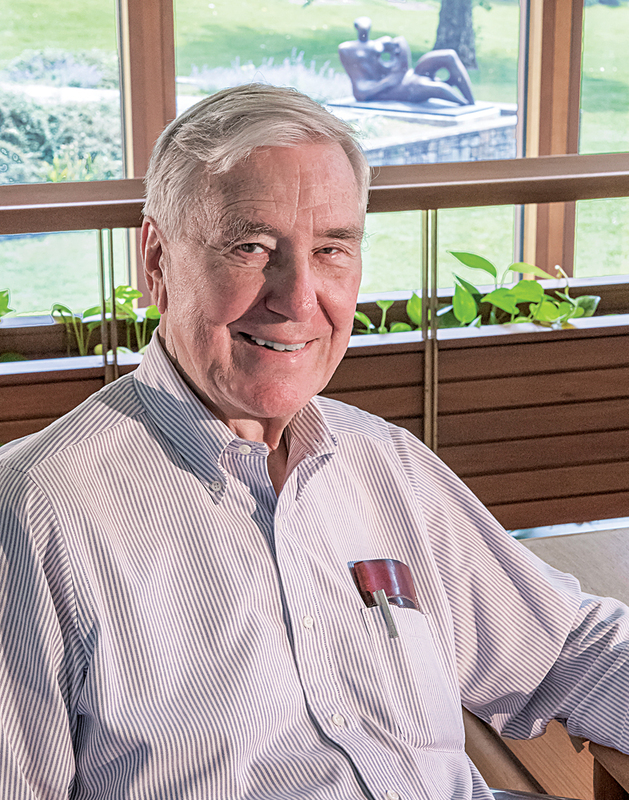 He went to museums on occasion, he says, but meeting artists, especially during his college years at New York’s Alfred University, represented “a great change for me.” Craft became a focal point. Miller’s first wife, Marcianne Mapel Miller, was a potter, and during his military service in Europe after graduate school, the couple visited ceramic artists whenever they had the chance, collecting what they could afford. Pieces from the Millers’ ceramics collection line one hall. The stairway leads to Marlin’s clay studio; the patron of makers has become a maker himself. 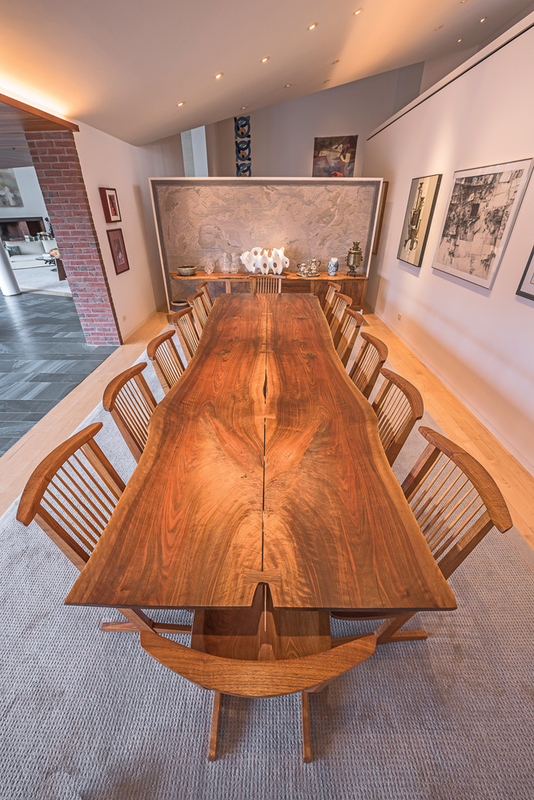 The 18-foot George Nakashima table allows for an ample guest list. 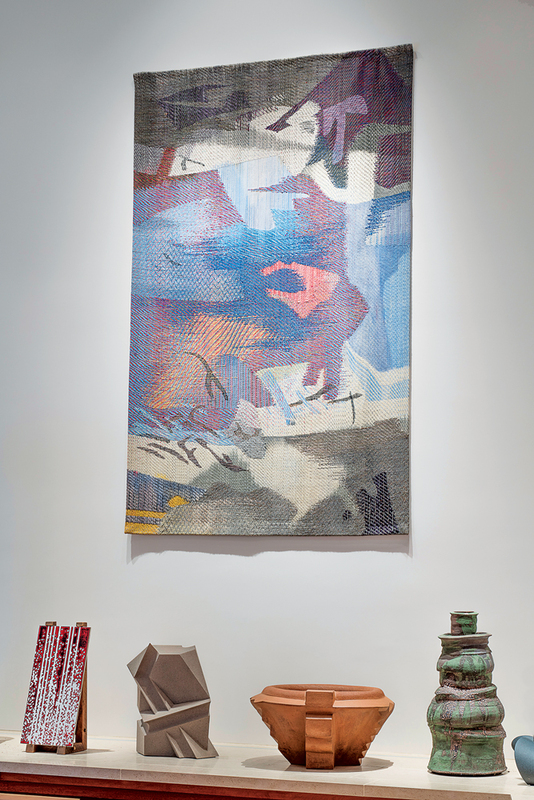 A Cynthia Schira weaving hangs above ceramic work by (from left) Wayne Higby, Anne Currier, William Daley, and Ken Ferguson. 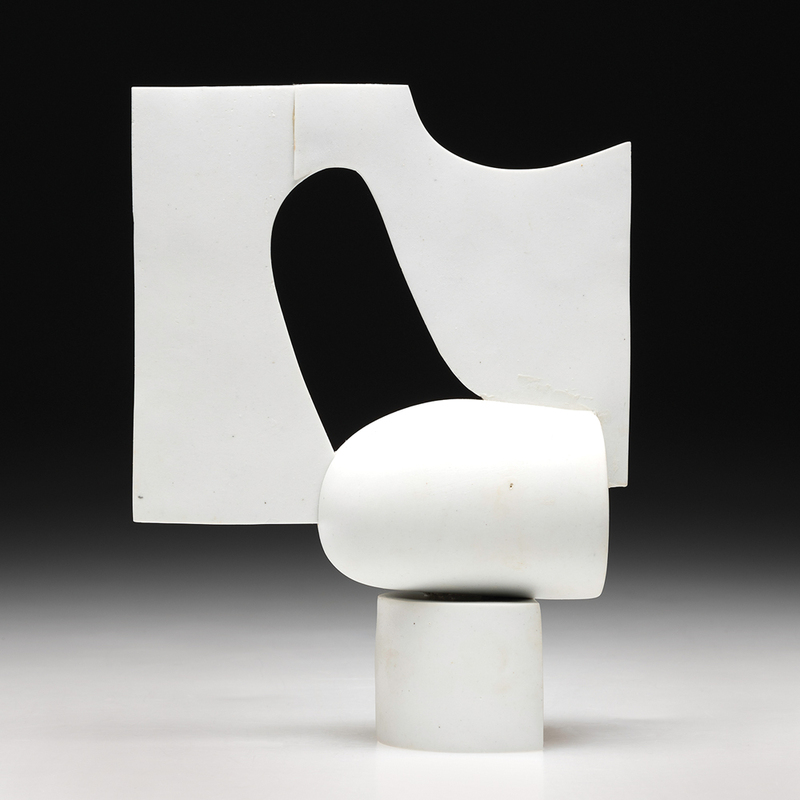 Ruth Duckworth, Untitled, 1991, ceramic, 10.5 x 8 x 3.25 in. 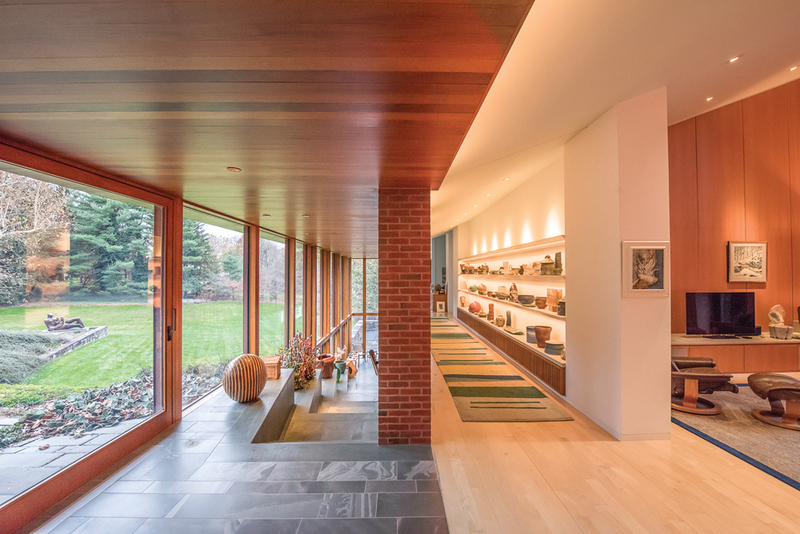 After Marcianne’s death, Miller married fiber and watercolor artist Regina “Ginger” Gouger in 1991, and the two built a new house in Reading, with plenty of room to display their collection. The dining room table is by George Nakashima, and a sculpture by Henry Moore – long a dream acquisition of Miller’s – sits in their backyard. Miller’s contributions extend well beyond collecting. In 1972, he joined the board of trustees at Alfred, home of the renowned New York State College of Ceramics, where Marcianne earned her BFA, and he later established a memorial fund in her name. For almost a decade, Miller also sat on the American Craft Council board, and in 2005, he co-founded GoggleWorks Center for the Arts in Reading. GoggleWorks hosts a full roster of exhibitions; its classes serve more than a quarter-million people each year. An exhibition shines a light on mental illness. A breathtaking installation at Tacoma, Washington's Museum of Glass offers a potent meditation on longing and loss. 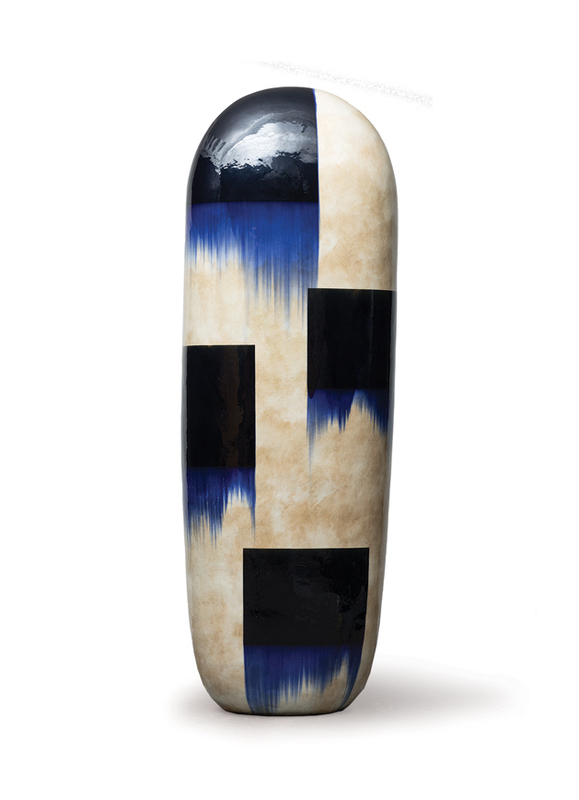 Few artists today make the sort of content-rich sculptural statements with glass that Beth Lipman does. Gentille was interviewed onstage at the 47th annual conference of the Society of North American Goldsmiths (SNAG).